Mira! Estoy Viviendo en Mexico! : Exciting Plans! I had been talking to my fabulous friend Zack O'Brien since this past spring about the possibility of going to Mexico for a Spanish language immersion program for some time now. 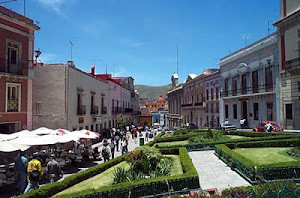 After doing extensive research on programs in Spain, Central America, and South America, I've made the decision to study at the don Quijote language school in Guanajuato, Mexico. I will post as regularly as possible during my program--stay tuned.